If you thought starting & running an orphanage is the biggest challenge, think again! The Banyan is an NGO based in Chennai that focuses on rescuing, curing and rehabilitating mentally-ill homeless women (primarily). 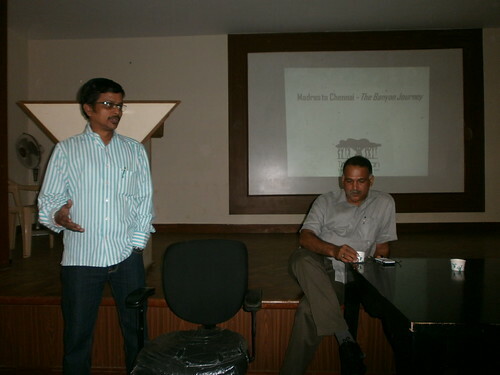 Recently, I went to their Madras Day event, ‘From Madras to Chennai: The Banyan Journey’ and this post is a recollection of the happenings on that day. 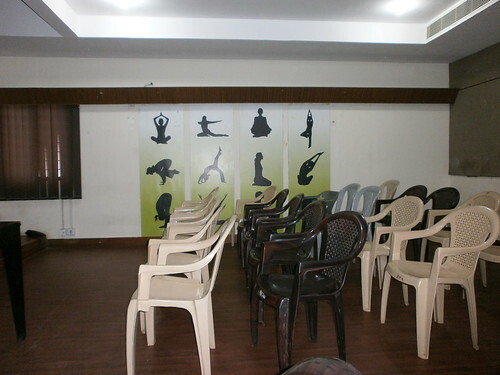 The above photo shows one side of their simple but thoughtfully designed conference room. I am familiar with the name of this organization, but I didn’t know what exactly they were doing. It seems, everything started in 1993 when one of the founders saw a homeless mentally-ill woman stranded on the street and (unlike us) did something about it. Thereupon, they rented a small house and now own a fairly large (and well maintained) facility – Adaikkalam. The land was donated by the Government and the funds provided by kind-hearted people. You may call it a Public-Private partnership! The Banyan is a residential facility where they take in mentally-ill & homeless women, provide them with professional treatment (through psychiatrists occupational therapists, general physicians, etc. ), teach them some form of life-support skills (if required) and then (try to) rehabilitate them with their families. An Out-Patient Center at Nungambakkam ~ For people who don’t need to be admitted. Community living project at Kovalam ~ For people who cannot go back to their homes. BALM (Banyan Academy of Leadership & Mental Health) ~ Education and training for creating new mental health professionals. Night Shelter at Santhome ~ Open transit care and night shelter for homeless men and families. A few professionals/volunteers from Banyan spoke to us on that day. Note: Photos are random as I am not able to recollect the exact persons. 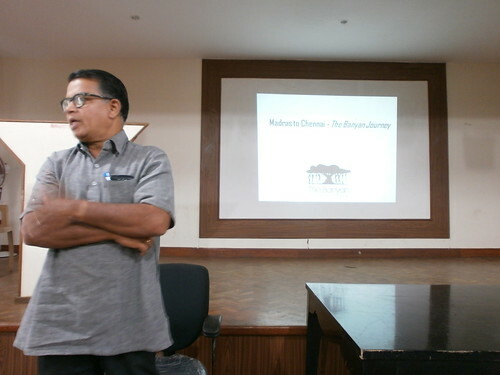 Dr. Kishore, spoke about homeless people in general and how that affects mental health. It seems, one in three homeless people become mentally-ill (some become homeless due to that reason) and most of them do not have access to treatments. He said that if the ailment is identified and treatment given at an early stage, mental illness can be remedied quickly (like, in a couple of weeks). But many people don’t know that mental illness is a treatable condition or whom to approach. Also, the stigma attached to visiting mental health centers keeps many from doing anything. He felt that a huge (societal) mindset change and awareness is required and mental healthcare should be integrated with primary healthcare (for quicker/accessible treatments). He insisted on the importance of preventing people from becoming homeless in the first place, as it is economically/practically not feasible to treat them after they are inflicted with some form of advanced mental illness. The Banyan is one organization that enjoys the support of passionate volunteers. Volunteers can get trained to offer technical services or even non-technical services. Two long-term volunteers RK & Diwakar told us how they used to accompany people who were cured, to reintegrate them with their families (often outside TN). They also help organize fund-raising events. Other volunteers spoke on how they engage homeless people (on the street), as a part of their street engagement program. They carry food-packets, give it to homeless people, strike a conversation with them and explore how they can help. It seems, people often view them suspiciously and sometimes it took weeks/months to build any trust. They then suggest that people could stay in their Santhome transit care center. Public can join The Banyan as a volunteer and assist them with their programs or they can help homeless people by themselves. Banyan’s inmates make a few products (like baskets, folders, decorative items, spreads, etc), which people can buy to show their support. Exhibition organizers (or any organization like schools, IT parks, etc) can offer them some space to exhibit their crafts. I saw a board in their campus – ‘This hall is sponsored by Infosys Foundation’ – Wasn’t I glad to see our corporate segment pitching in with support! Numerous people (including movie stars) have supported The Banyan in different ways. Have a look at one brilliant video made by Trilok/Sharda, Santhosh Sivan & A R Rehman for the Banyan. A very thought provoking post.The faces and expressions of homeless and ill persons depict the dejection and pain.It is heartening that the Banyan is taking good care of them.The video showing their smiling faces and dancing with joy is so encouraging. Good work! Humanitarian approach has transformed them. Wish more people should come forward to give succour to such needy ones. Sometimes, humanitarian approach can cure what all the medicines in the world cannot. Mental disorders afflict a large population and since the awareness and stigma attached with it is high the patients are ill-treated and abandoned by their own families. This initiative from Banyan is so noble and a step in the right direction. Kudos to the team. More power to them! Yes. Such initiatives are very much required as mental health professionals are very few. More people should focus on mental health professionals and the society should stop discriminating against this much-needed stream. Of course, this profession is very lucrative. Thanks for sharing this post Rajesh! You have done a yeoman service by highlighting about Banyan and the admirable work they are doing for the mentally challenged people especially the destitute.It is heartening to know that quite a large percentage gets cured if treated in early stages. Yes, if treated in early stages, mental-health gets restored fast. It can also be cured later, but patients may require more time. There are some advanced mental illness (which they named, I forgot the names) which are very difficult to cure. Thanks for writing about this organization. Can you give me their address or link? Thanks. thebanyan.org – Their website address. It takes so much to dedicate your time for others’ well being. #Respect for all those individuals who are making a difference to the life of so many others. If we genuinely believe that the world is a wonderful place, we’ll make sure that it is. In the process, we’ll reinforce that concept in our own minds and inspire others too. Many leaders believe in it. That’s really great what they are doing. I really want to spend some time volunteering in future. I had read about the founders of this organization and an act that none could take easily. One of my mom’s aunt also got treatment there for her mental-illness, anyhow she’s no more now but only then I know they treat out-patents as well. Hope your post get know many on this noble organization. It’s one thing to believe in something and another to make others believe in it. The founders seem have done an excellent job with both. You mentioned that homelessness can also cause mental illness. I think so too. I mean, imagine what would happen to us if we were homeless and abandoned! That’s right. Mental illness comes due to mental suffering right? Homelessness causes much mental suffering. The video is stunningly made….and heartbreaking. Santhosh Sivan and A R Rahman involved in it eh? It shows…. Yes definitely, thanks for your comment SM.